This movie is AMAZING! I've never seen anything like it. I was thoroughly spellbound throughout this mystical movie. There is great action, romance, comedy, and the most superb fight scenes. And it's all tied together by a wonderful story into which are woven themes quite universal in nature. The story is something of a fantasy tale set in ancient China. Li Mu Bai (Chow Yun Fat - below, right) is a great and masterful warrior in the Giang Hu life. The Giang Hu is something comparable to the Jedi of Star Wars lore; they are warriors sworn to protect and bring about peace. The Giang Hu are also blessed with certain powers to aid them in their fighting skills. They have the ability to defy gravity for brief moments in time (check out the fight in the treetops in the picture above -- awesome!). 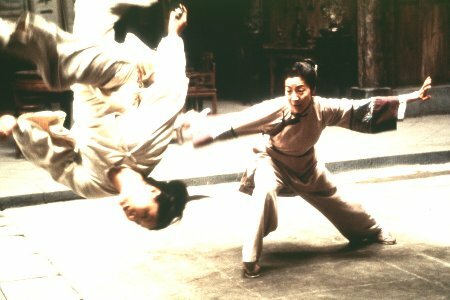 Li Mu Bai has long secretly admired his longtime fellow friend, the female warrior Yu Shu Lien (Michelle Yeoh - who has appeared in many Jackie Chan films as well as a James Bond one - Tomorrow Never Dies). She is quite a babe, but that is besides the point. Li Mu Bai and Yu Shu Lien never follow through on their feelings for each other out of respect for Li Mu Bai's best friend who is Yu Shu Lien's late husband. Li Mu Bai has sworn to protect her and has faithfully done so for many years. Li Mu Bai finds himself getting older and is prepared to retire from the warrior's life. He sends Yu Shu Lien to give his famous sword, the Green Destiny, to Sir Te, a friend of Shu Lien's father. However, once in Sir Te's possession, the Green Destiny is stolen by a mysterious masked warrior. What is more, Jade Fox, an infamous female villain and the killer of Li Mu Bai's best friend, is rumored to be nearby. Meanwhile, Shu Lien has befriended a seemingly innocent young girl who is the daughter of Governor Yu. We later find that the young girl, Jen, is actually quite gifted in the martial arts. She is also quite gifted in being a babe, but again, that is besides the point. 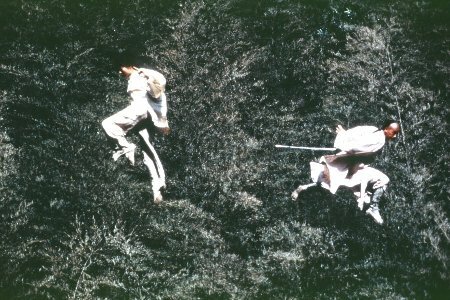 The story then takes shape as Li Mu Bai is summoned to retrieve the Green Destiny and to seek his revenge with Jade Fox. Jen is a young and extremely powerful warrior with enormous potential whom Li Mu Bai would like to take on as an apprentice. In another Star Wars comparison, this is not unlike Qui-Gon Jinn wanting to teach Anakin the ways of the Force. We then see two love stories begin to develop. One is between Jen and Lo, a rogue bandit living in the desert (they are both pictured below). The other is the hidden love between Li Mu Bai and Yu Shu Lien. The many subthemes found throughout the story all point to and eventually arrive at a great and climactic ending. I LOVED THIS STORY! I was drawn to the characters as well as to the time and place of ancient China. The buildings, the landscapes, the clothing, and the attitudes of the people resonated within me. But what is more, I loved the stunning visual effects and the exciting and intricate martial arts fighting sequences. One of my favorite scenes in this movie was the fight scene between the elder Shu Lien and the younger Jen. This female battle was perhaps one of the best in the whole movie. Not only did it blow me away in its display of martial arts to the max, but it was quite entertaining and funny at times how each one would try to outdo the other in selecting weapon after weapon from the walls of the training room. See the final picture below for a shot from this scene. The fight choreographer for this film is the same one used in the Matrix, Woo-ping Yuen. This guy is amazing. His stuff was featured for just a tiny bit in the Matrix, but it wow-ed audiences all over the world. Well, with Crouching Tiger, Hidden Dragon, Woo-ping Yuen was given full reign, it seems. This movie is packed with the most amazing stuff I've ever seen. Perhaps my excitement over this film is partly due to the fact that this was originally a Hong Kong movie. My Chinese friends tell me that this kind of movie is very prevalent in China. But to American audiences, this stuff is very new and very exciting. I think that is why it has done so well over here and why it won so many Academy Awards (which was quite an accomplishment for a foreign filmmaker). Being that this was a foreign film, there is no spoken English. It is subtitled. It took me a couple of minutes to get used to this, but after that, I was completely absorbed. Some people that I know who went to see this film came away complaining that they did not like the film, and they based this entirely on the fact that there were subtitles! I think that this speaks more to their lack of intelligence and the ability to read fluidly as opposed to what it says about the film itself. Rather than droll on and on about how much I love this film, I challenge you to see it now. It is really best seen in the theater (I would imagine that the scope and power of this movie would not be as effective on a TV screen). I'd like to close with a funny quote. Steve Martin, when hosting the Academy Awards, mentioned how he loved seeing this movie, but that he still couldn't figure out the title, Crouching Tiger, Hidden Dragon. After all, he did not see any tigers or any dragons at all in the entire movie. "Then it hit me," he said. "They were crouching and they were hidden!" 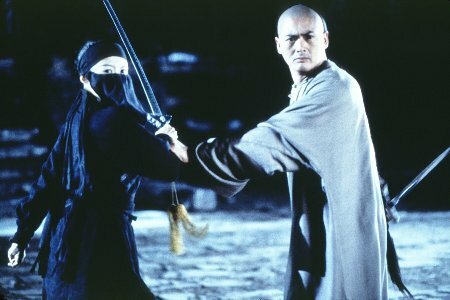 How would you rate the movie Crouching Tiger, Hidden Dragon? There have been 17436 people to visit this page since Fri, Jan 26, 2001. And you are the first person to visit this page today!